y Russian boat page presents the sparse information I've uncovered to date on the boats actually built in Russia. The material presented here about boats never built provides insight into cigar boat construction concepts and the Winans innovative thinking. 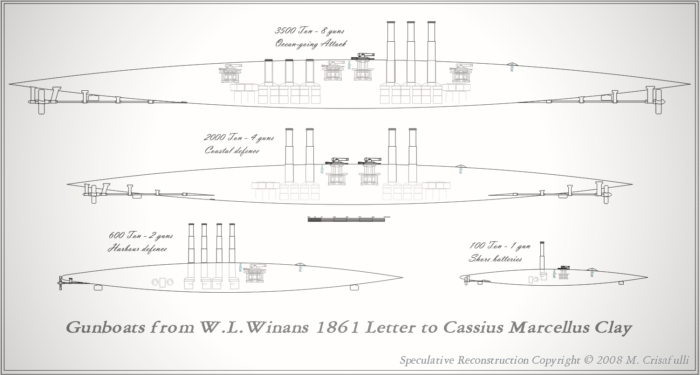 William Louis Winans prepared a detailed proposal to the Russian government for three gunboats, one of 500 tons displacement with two guns, one of 1000 tons displacement with three guns, and the last a 504-foot long, 3000-ton monster with six guns. The proposal, inked in fine Victorian script, includes many illustrations and descriptions of technical details, and contain William Louis Winans' penciled and initialed notes. There is a memorandum57, entitled "War Vessels on the Spindle Principle", that discusses the benefits of the special construction and how these are realized. An annex55 provides detailed estimates of dimensions, weight, etc. Large plans56,58 depict two of the gunboats. The 3000-ton gunboat had a diameter of 36 feet, a nominal draft of 21 feet, and been capable of 22 knots. The draft, displacement, and performance changed depending on the thickness of the armor plate chosen, varying from four to 21 inches55. 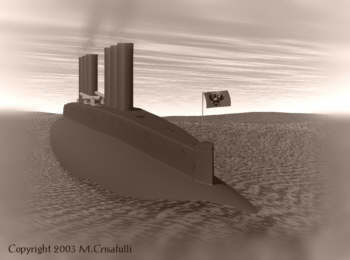 It would have had six double boilers and two engines fore and aft, driving a large, submerged propeller at each end56. The superstructure could have been open on top, but I've covered it in the renderings of the proposed boats on this page. The large gunboat carried two small and four large guns, normally recessed within the superstructure but having a mechanism to raise them for firing56. This appears to be the mechanism described in William Louis Winans' 1865 Patent 46516. 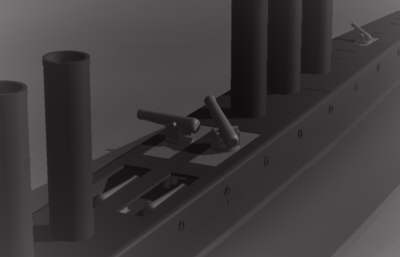 Click here to view a 3D reconstruction of the 3000-ton gunboat. The 500-ton boat was more modest, with four double boilers and two engines driving a single prop at the stern. The plan shows two retractable guns and dimensions about half that of the larger boat58. At 250 feet the smaller boat would have been nearly as long as the Ross Winans and its beam of about 20 feet would have been greater. Its maximum speed would have been nearly 19 knots. The impression below shows one of the guns, situated forward of the stacks, in the raised position. 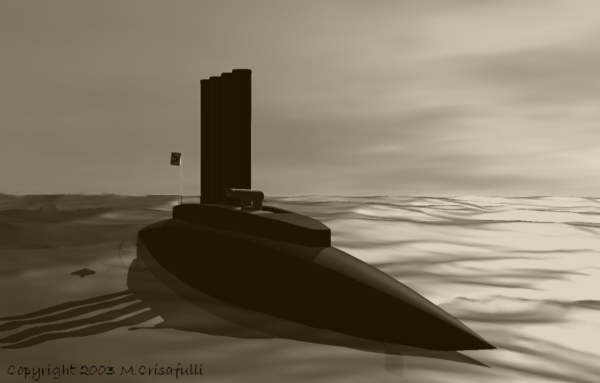 Click here to view an earlier 3D reconstruction of the 500-ton gunboat. Like the Ross Winans, the proposed boats are pictured with a superstructure, called a "shot-proof gangway" on the plan for the big gunboat56. The larger has the superstructure attached above the hull, like the later yacht, but that of the smaller is built into the hull. Patent 161516 describes both arrangements. Both have anchors like the Ross Winans (Patent 31276) and rudders fore and aft56,58. 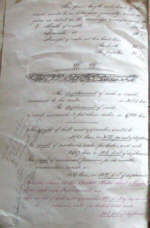 The Russian proposal material is dated July 1861. In a somewhat rambling December 1861 letter to Cassius Marcellus Clay80, the American Minister to Russia, William L. Winans proposes a fleet of gunboats, on the "spindle principle" to counter what he saw as the threat of imminent war between the United States and England. Much of the technical detail in the letter is condensed from the Russian proposal but there is some information not obvious in or missing from the earlier documents. 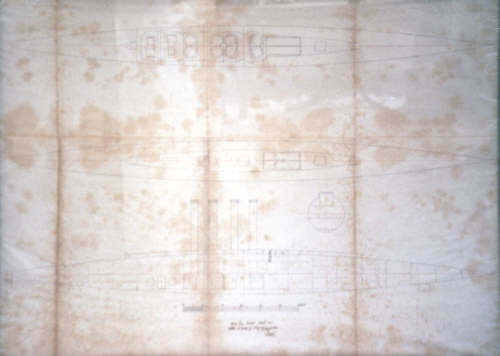 The letter states that the proposed construction does not use frames, but that the arched hull plates are joined together and hull stiffening is provided by the many watertight bulkheads, "28 to 35 ordinarily in large vessels". A major benefit of the spindle shape is that when facing an enemy end-on or nearly so, shot would strike nearly everywhere at obtuse angles (although the text calls them acute) and deflect off with little or no damage. Winans summarizes the results of shot tests against an inclined target that simulated the spindle hull plating. He found that among other improvements, screwing plates together provided much better results than rivets, "the latter flying when hit". One of 3500 tons register, with 1¼ to 1½ inch plating, "armed with six or eight heavy guns" to "cruise about the British Islands with perfect impunity" and "injure her commerce and sink as many ordinary vessels of war as might be sent against her". The proposed vessel would have a two-bladed screw under each end. A few of 1500-2500 tons register, "with slightly thinner iron", and with four to six heavy guns would be "well suited for our coast defences". Some of 400 to 800 tons resister, with two to four guns, "would be valuable for harbour defences". "Very much smaller ones with power merely for taking and keeping position, with a single large gun, would make good batteries for operating in shallow water, against shore works, and likewise be useful in harbour defence". At this time I don't know how far this proposal went. Winans requested the reference material be forwarded to Washington. He mentions sending a copy to "Mr. Adams" to send to "Mr. Lincoln". I find it interesting that the patent referenced, 46516, for operating gunboat ordnance, was signed by William L. Winans in January 1862, but not granted until 1865. The reconstructions below, shown to scale, are based the descriptions and drawing in the letter, the Russian gunboat proposal drawings, and patent 46516. They range in length from 530 to 146 feet. I've shown completely retractable telescoping smokestacks for all but the smallest boat. Its small size makes complete retraction difficult. I've also placed a low armored helmsman's tower forward on each hull. The two larger gunboats have props at each end, but I've used a pair of small props at each end for the coastal defense boat to minimize draft. Similarly for the small shore battery boat. The largest boat has four pairs of large guns, the next largest two pairs, and the next one pair. The shore battery has a single small gun although there might be room enough for a large gun. All are retractable per the patent. Many, many thanks to Steve Walk and the Winans family whose generous access to the family archives provided the Russian proposal material presented on this page. The Polish paper models web site Renova Model offers a free 1:200 scale paper model of the 500-ton gunboat. Please note that nearly everything is in Polish and that the model parts print on A4 paper, a European format that is slightly longer and narrower than letter paper. Still, using selection and multiple pages, I was able to print everything full-size on letter-sized cardstock. Except as noted this page and its content © Copyright 2003, 2006, 2007, 2008 Michael & Karen Crisafulli.